The weather is starting to feel like fall and for me, that's the start of change. Things that change here at our bed and breakfast, Sandlake Country Inn means the clean air is crisper, a little lighter schedule and I can take some time to try new recipes to keep me inspired in the kitchen. Today's inspiration came from a carton of ricotta cheese in the fridge and some left over lemons. Hmmm, I had heard of lemon ricotta pancakes, but I've never cooked or eaten them. It was time to change that! When looking for new recipes I look for simple, quick and delicious. Just like most busy working people! 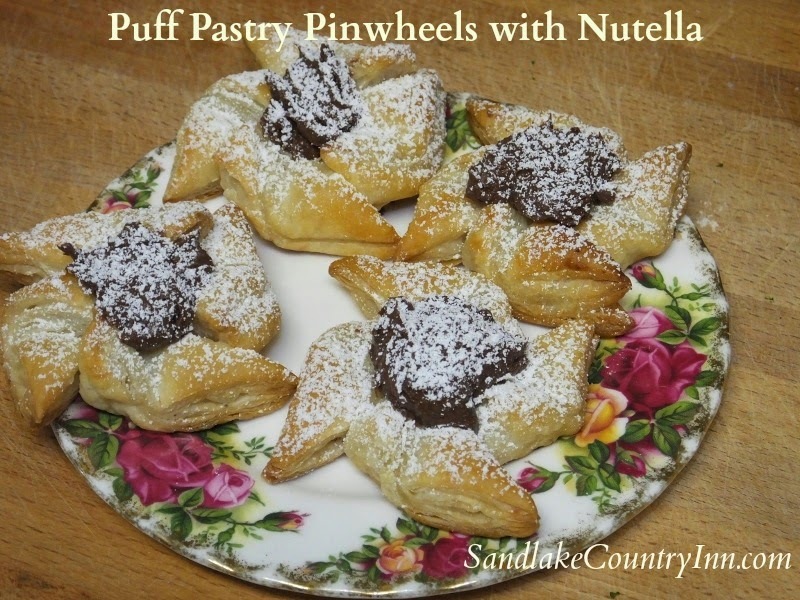 These turned out fabulous and were light, fluffy and quick to whip up. 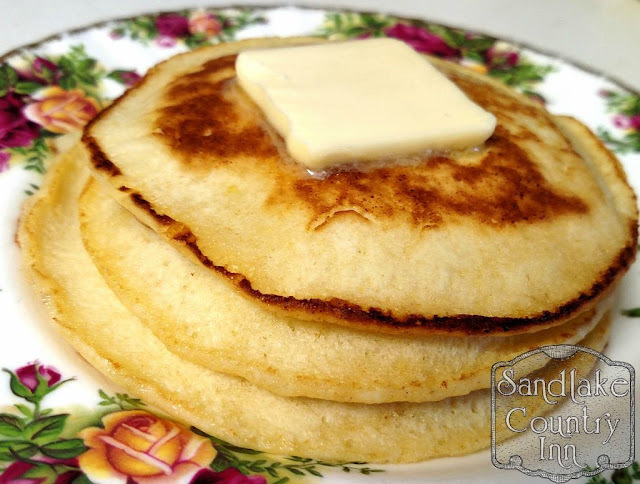 At Sandlake Country Inn, we deliver breakfast to the guest's door and when we have a full house, it's too difficult to get pancakes to the door and keep them fresh and hot. So, pancakes are served when we have less rooms filled which was what was happening this morning. If the guest's empty breakfast basket is any indication, these Lemon Ricotta Pancakes are a keeper! Preheat electric griddle to moderately-high heat. In a mixing bowl whisk together flour, granulated sugar, baking powder, baking soda and salt. Set aside. In a separate large mixing bowl, whisk together milk, ricotta, eggs, vanilla & melted butter until blended. Then, whisk lemon zest with lemon juice and add to milk mixture. Pour into flour mixture and whisk just to combine. Pour about 1/3 cup batter onto buttered griddle and cook until bubbles begin to appear on surface of pancake. Flip and cook until golden brown. I served the Lemon Ricotta Pancakes with pure maple syrup or wild huckleberry syrup, scrambled eggs with chives from our garden, bacon and the fruit was watermelon. 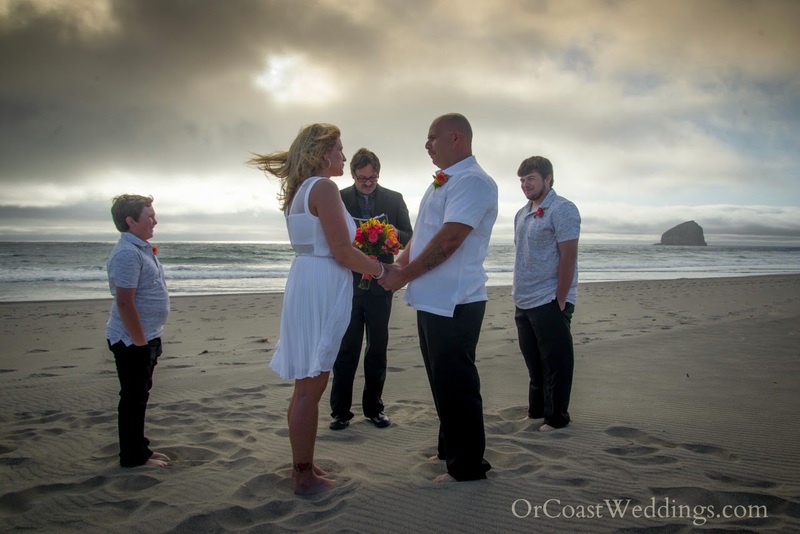 By the way, fall is a great time to visit us on the Oregon coast. Crisp weather, less tourists and hey, I just might be able to make you these light, delicious Lemon Ricotta Pancakes! Whether you're cooking for a crowd or just 1 person, this recipe works for all. A unique blend of eggs, cheese and Italian marinara blend together for a savory breakfast entree. Italian Eggs is one of our guest's favorite dishes at our Oregon coast bed and breakfast, Sandlake Country Inn and it's so simple, even the non-cook in your family can make it. Preheat oven to 350 degrees. Spray a 9 x 13 baking dish with cooking spray. Spread marinara sauce onto bottom of dish. Sprinkle Parmesan cheese on top of sauce. Next, sprinkle shredded cheddar. Beat eggs and sour cream together until smooth. Pour egg mixture on top of cheeses. 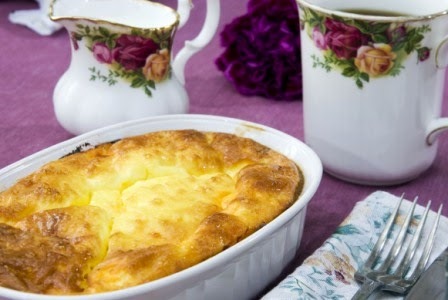 Bake for approximately 45-50 minutes or until top is slightly brown and eggs are set in middle. The above recipe is for 8 large servings. For 4 servings, divide recipe by 1/2 & bake in a, 8 inch baking dish. For individual portions, use an oval ceramic baking dish as shown in picture, cover bottom of dish with a light portion of sauce over bottom of dishes, sprinkle with approximately 1/8th cup Parmesan Cheese on each, then sprinkle approx. 1/4 cup Cheddar cheese for each dish. Whisk together 5 eggs and 1/3 cup sour cream and pour on top of cheese. Don't worry, you can't mess this recipe up! Bake for approx 30-35 minutes or until lightly golden on top. 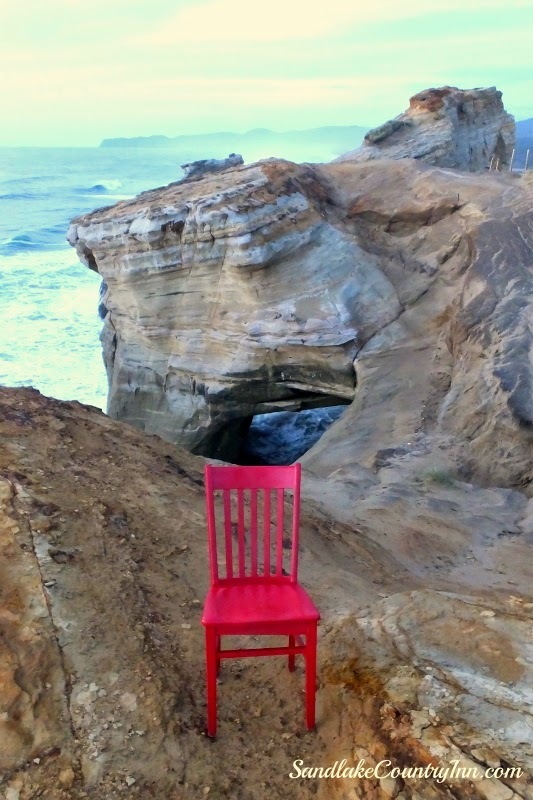 The Red Chair Travels journey began in winter of 2012 when an innkeeper on Cape Cod took a picture of her red porch chair perched on the ice behind her house. After posting the picture of The Red Chair on facebook the magic of the internet created a celebrity and started a viral & physical journey still happening to this day. Now a travel phenomenon, The Red Chair needed a bit of organization and in stepped Bedandbreakfast.com to organize it's journey. 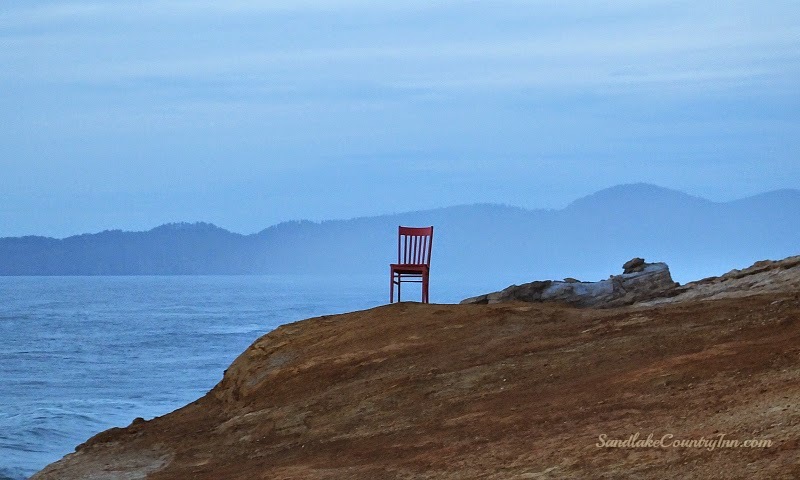 The Red Chair, or affectionately known as "Red" has developed it's own personality and has traveled from B&B to B&B by innkeepers who have documented his travels by taking photos, blogging and sharing them on social media. 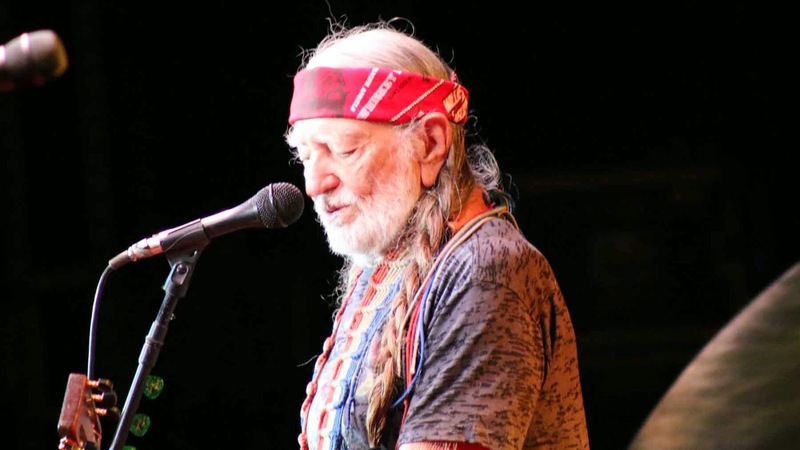 After traveling all over Cape Cod & New England, Red then made his way down the east coast and has now traveled to 23 states and now has made it's way to the west coast. In Oregon, Red is being hosted only by members of the Oregon Bed and Breakfast Guild. Members of OBBG are all inspected and approved B&Bs which have reached a high standard of excellence. 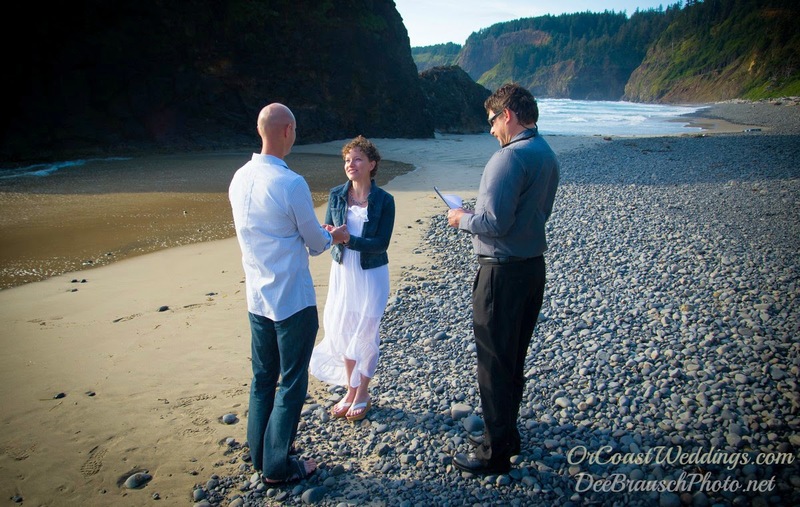 We are so honored at Sandlake Country Inn to be a member of the Oregon Bed & Breakfast Guild and to host Red to show him the beauty of our beautiful slice of heaven on the Oregon Coast. 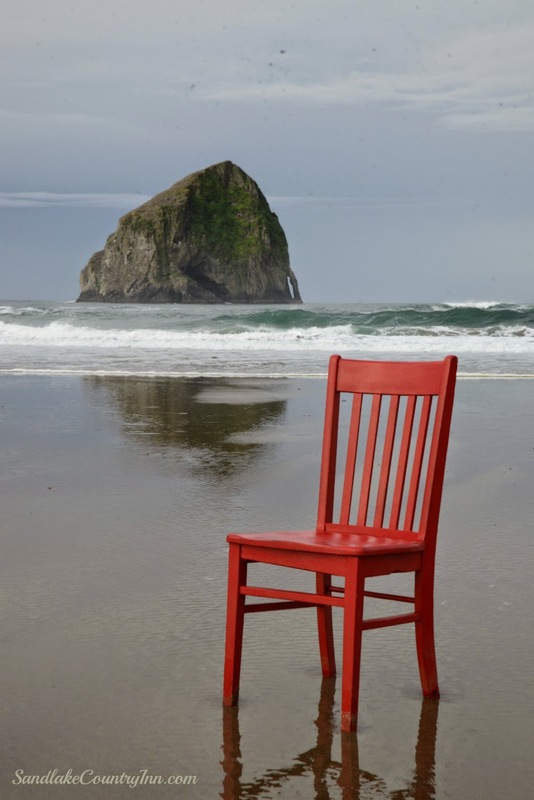 Follow us on our blog to see the adventures of Red and imagine yourself experiencing our section of the Oregon coast as the Red Chair Travels on it's journey in Oregon. 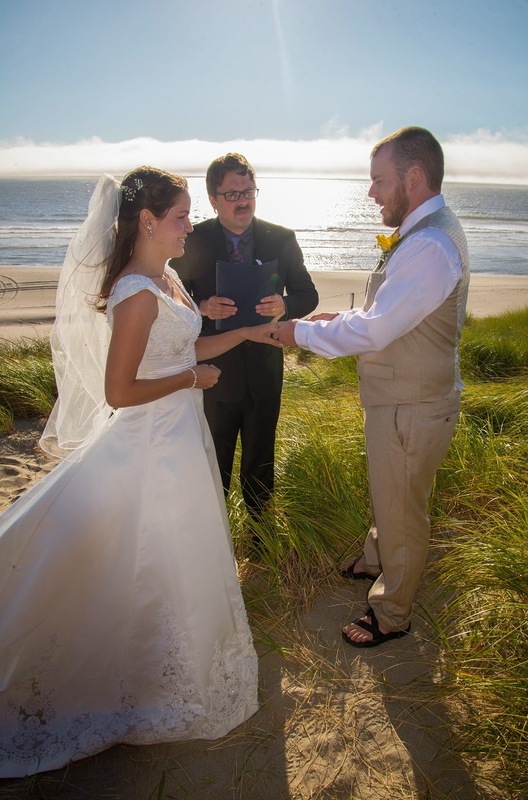 We, Diane & Ron Emineth are the innkeepers at Sandlake Country Inn. 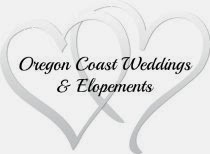 We anxiously waited for Red and were excited to take him all around our Three Capes Scenic Route and the fertile farm lands and dairy farms of Tillamook County. Red's first stop was our beautiful Haystack Rock in Pacific City. 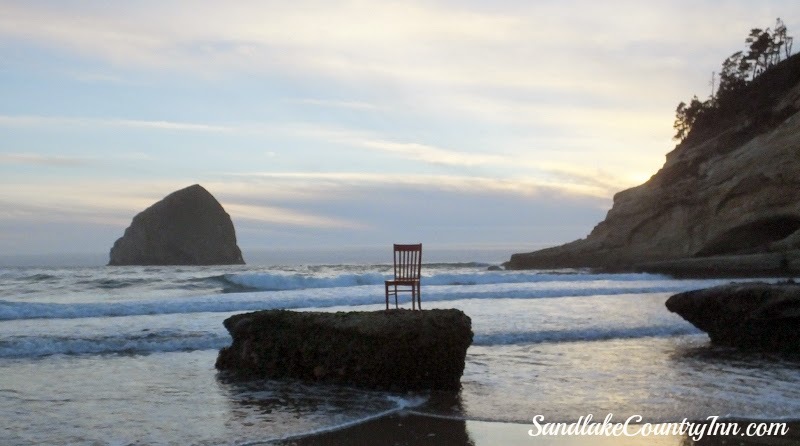 Just 8 minutes south of Sandlake Country Inn, Pacific City is Haystack Rock and Cape Kiwanda. Red took a little hike up Cape Kiwanda to experience amazing views and beautiful rocks and sea caves. It was a long day and Red enjoyed experiencing sunset atop Cape Kiwanda. 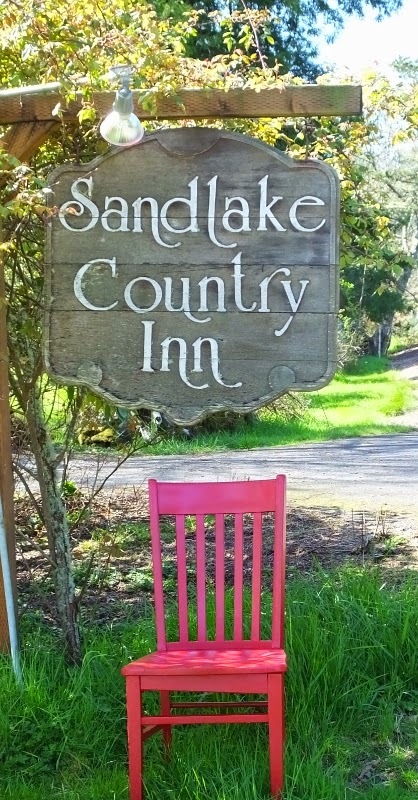 Follow our series of blog posts on The Red Chair Travels to Sandlake Country Inn. 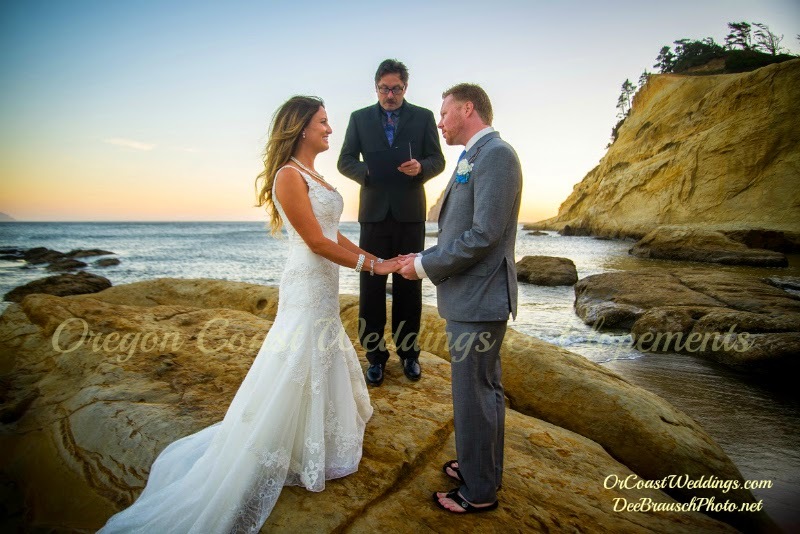 If you're planning a trip to the beautiful Oregon coast, we'd love to show you the hospitality of our B&B and personally help you experience our Oregon coast just as Red did!